Select Sliding Scale from the Type of Plan drop down. 5. Choose to base your commission levels on Gross Commission or on Sales Price. We will use gross commission for this example. 6. Choose whether to pro-rate the levels. Pro-rate levels means that the system will max out the current level before moving the agent to the next level. For example, if level 1 of your plan is $0-$40,000 in gross commissions at a 70%/30% split, and the agent has done $35,000 in gross commissions so far. On their next deal, they earn $10,000 in gross commissions, we will apply $5,000 of that commission towards this current level at a 70% split, taking them to $40,000, and then move them to the next level and apply the remaining $5,000 of the commission at the higher split rate. Let's look at an example of how this setting works. A gross commission sliding scale plan with Level 1 from $0-$10,000 at a 50% split, Level 2 at $10,001-$20,000 at a 75% split. If the agent's past gross commission volume is at $9,000, and the current commission disbursement you are creating has a gross commission of $5,000 putting the agent's total gross at $14,000, and you choose Starting Value then the commission will be calculated using the $9,000 value, the starting value before the new value was added, and the agent split will be 50%. If you choose Ending Value, the commission will be calculated using the $14,000 value, the ending value after the new value is added, and the agent split will be 75%. 8. Next we'll set up each level of our commission plan. We're using gross commission for this example so the agent will move from level 1 to level 2 when they exceed $40,000 in gross commissions, from level 2 to level 3 when they exceed $80,000 in gross commissions, from level 3 to level 4 when they exceed $100,000 in gross commissions. If you want to charge a fee for each level of your plan you can enter that info into the Closing Fee Item and Amount fields. 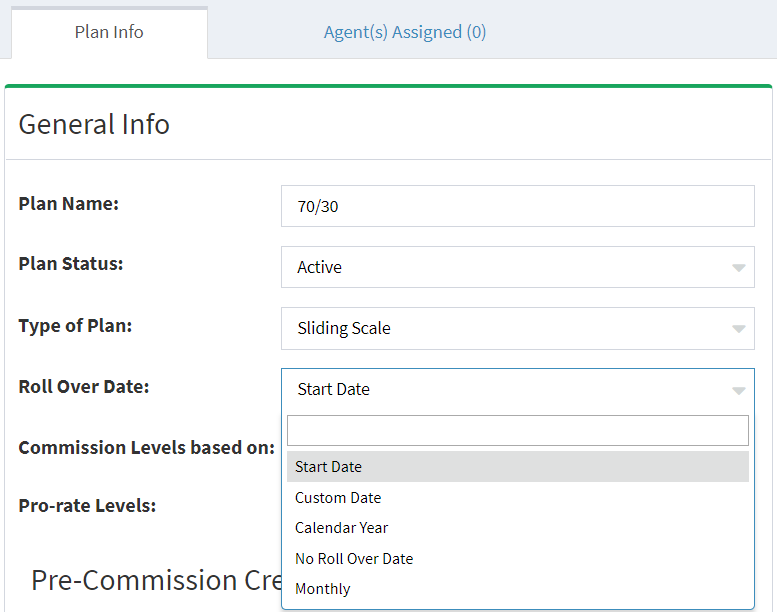 This feature allows you to adjust your fee based on the level of the commission plan. You can choose a dollar amount or a % of the gross commission, agent's commission, or sales price. If you have a cap on fees that you set during step 7, these are the fees that will be applied towards that cap. This fee will be automatically deducted from the agent's commission when you create a commission disbursement. 9. Next, do you have a cap on transaction fees? For example, if you charge 1% of the sales price but only until the agent has paid $1,000, you can set that up by adding the 1% fee based on the sales price, and select Yes to Cap on Fees, and then enter $1,000 in the Cap Amount field.